Non-Drip Wax Candles are available in a variety of attractive colours, allowing you to create beautiful presentations, within your restaurant, hotel or bed and breakfast. The candles can be matched with other tableware such as slip covers and napkins to give the best, most attractive, display for your clients. The candles will fit into most standard candle holders. Smokeless and non-drip wax construction. 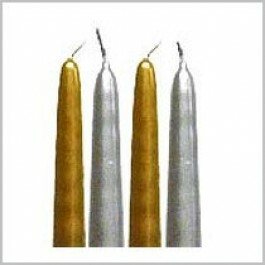 Metallic finish candles available in either Silver or Gold. Also available in 14 other different colour variations. Sold in packs of 12 candles.